The Chapel at Fort Ross has been dissed by a saint as "rather plain;" fouled with the waste of Goats, sheep, chickens and cattle: beaten and torn by the winds and rains and storms of the Pacific and splattered with graffiti by "Yankees." Its church bell was sold to a San Francisco junkyard. The structure collapsed to the ground- a pile of rubble -demolished by the 1906 San Francisco earthquake. It was rebuilt. Then it burned to the around and was rebuilt again. This "plain" house of God was never consecrated as a `real' church; never had an `official' saintly church name other than `chapel'; and, never had a pastor. 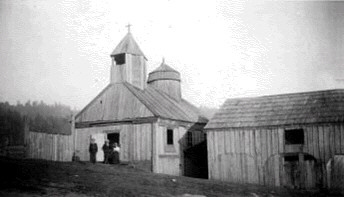 Yet it stands today, nearly 200 years later, as the centerpiece of a historic state park-a testament to Czarist Russia's North American exploration, commerce and Orthodox faith. thirteen-foot tall redwood plank stockade. The palisade was designed to protect the Russians and their Aleut slave laborers from local Indian and Imperial Spanish soldiers. The distinct house of fellowship is surrounded by 19th Century cannon and mortars. All of this is located on a breathtaking bluff overlooking the Pacific Ocean with groves of mighty Redwoods as its backdrop. The Russians selected the location for reasons of defensive strategy-still, though the site is beautiful. majestic and inspiring. The invasions never came and the cannons were never fired in anger. The settlement had come about when in March 1812, the Russian sailing ship Chirikov anchored in the tiny cove fifteen miles north of Bodega Bay. The ship brought twenty-five Russian craftsmen and eighty native Alaskan Aleut laborers. Their purpose was to build a settlement. They called the settlement Fort Ross, loosely based on the Russian word (Pinney) Rossiia-meaning Russia. Put in historical perspective, as the fort was nearing completion in the summer of 1812, Napoleon Bonaparte's 250.000-man French army invaded Russia then ruled by Czar Alexander I. The same month, in Washington. D.C., President James Madison asked for and received from Congress a declaration of war against Great Britain. California, the site of Fort Ross, was then a colony of Imperial Spain as was present day Nevada. Arizona. Texas and parts of New Mexico, Colorado, Utah and Wyoming. Russian explorers had come to California to organize and develop fonts to provide foodstuffs for their Alaskan colonies some 1.100 miles to the north. The harsh physical environment of the Alaskan landscape precluded settlers from growing sufficient food for the colony. As an added bonus, a huge sea otter population was available for exploitation for the lucrative international fur trade. After twenty-nine years of occupancy, the Russians abandoned the Fort in 1841. According to the historian Hubert Howe Bancroft they had taken 13.600 sea otters during their occupation-essentially depleting the species to near extinction. The Pacific had no more to give. Their agricultural endeavors never succeeded. Pesky gophers fed gluttonously on their crops-they harvested the planted rows faster and better than the Russians.